Mirghol, a.k.a Mreegal or Mrigel (Cirrhinus cirrhosus: Cirrhina mrigala) 100.0 cm max. Published weight: 12.7 kg. Inhabits fast flowing streams and rivers. Fisheries harvest 40cm fish weighing 1000g and of about 3 years. A very active fish that thrives in ponds but spawns in swift rivers. Now mrighol is artificially spawned and raised even in small household pools as in the two ponds of the De Launey House in Comilla. Fingerlings are in great demand for stocking ponds between July and November. Heat 3 tablespoons oil in a korai/wok, toss in the dry red chillies, and sauté until chillies change to a shade darker. Strain them out with a slotted spoon and reserve. Rub the fish steaks with: 2 teaspoons salt + 1 teaspoon turmeric. And in the oil left in the korai/wok (add more if required), sauté the fish lightly on both sides. Set cooked fish steaks aside. In the same oil (add more if required), lob in the onions, sauté until translucent. Next, pour in ½ teaspoon turmeric diluted in 3 tablespoons water. Cook the onions until they get a shine on their surface. Stir in ginger paste and poppy seed paste. Cook stirring vigorously for 2 minutes. Pour in the yoghurt, mix up, lower the flame, and cook until the yoghurt releases water and starts to simmer at the edges of the broth. Add the following: cooked fish steaks (#2), fried dry red chillies, 1 cup water and 3 teaspoons salt. Bring contents to a boil. Cover with a lid and cook for 5 minutes. By this time if the gravy is not thick enough, cook for a further 2 minutes, uncovered. Sprinkle with ghee, green cardamom, cinnamon powder. Stir to mix, serve hot with rice. Shalgom or turnip was introduced to Bangladesh from Kashmir, at an unknown date, probably during the Mogul occupation. Varieties of Turnips are used for their roots; their leaves are medium green and rough. The root may be white or white and purple. They are tender when they are young. The newly introduced, green coloured Ol Kopee (Kohlrabi) is gaining in popularity over turnips. Use kohlrabi in place of turnip if it fancies you. Plunge green tomatoes in boiling water and cook for ½ min. Take out and chuck them into ice water. Peel the tomatoes, chop into small pieces and grind to a smooth paste. Heat oil in a korai/wok; toss in the cloves and cook undisturbed for few seconds. Stir in onion paste, garlic paste. Saute stirring vigorously for 2 minutes. Mix in green tomato paste and tomato wedges. Saute stirring for 2 minutes. Add turnip, green chilli paste. Cook stirring for another minute. Slide in the fish fillets; cook stirring till the fish pieces are coated with the gravy. Cook until fish is half done. Pour in mint paste and ½ cup water. Bring to a gentle simmer and cook until fish is tender. Sprinkle with grated lemon zest, mix up and take off the flame. Serve with the lettuce leaves scattered on top. 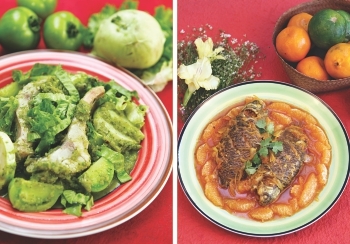 Koi Komola is quite a unique dish in Bangladesh, where cooking with ripe fruits are quite uncommon. The only other ripe fruit used to cook Torkari is the pineapple. See Elish Anarosh recipe. Slit the throat of the fish and pull out their entrails. Cut off the fins and trim the tail ends. Sprinkle 1 tablespoon salt over the fish. Rub in the salt to help absorb the mucus off the skin. Place the fish in salted water and let them soak for 30 minutes. Drain the fish, and rinse them under running water. Pat them dry with a paper towel. Dust them all over with 2 teaspoons turmeric. Shallow fry them on both sides, in hot oil. Once they are cooked, lift them off the oil and place them on absorbent paper towels for further draining. In the same korai/wok, add some more oil, when smoking hot, add sliced onions, saute until they turn translucent. Stir in ginger, and cook stirring constantly until ginger releases its cooked flavour. Lob in garlic, saute for a few moments stirring all the time. Pour in ½ teaspoon turmeric, red chilli, 2 tablespoons water. Stir-fry for another minute. Next, add coriander, cumin, 2 tablespoons water. Saute stirring continually until oil separates from the spice. Pour in 2 cups of water, sprinkle with salt, and bring it to a boil. Slide in the fried fish and heat through. Next, add sugar, organge juice and cilantro. Cook for a minute. Transfer the cooked food to a serving dish. Arrange the tangerine segments on top and serve. Place turmeric, coconut, salt, mustard seeds, oil, red chilli powder in a food processor/grinder/ and grind into a smooth paste. Coat the fish steaks on both sides with this paste. Pass the banana leaves over an open flame to soften the brittle leaves. Cut a portion of the leaf to the exact measurement of the dish's diameter. Keep the larger piece of the leaf for covering the bottom and the sides of the dish. Grease an ovenproof dish with 1 tablespoon mustard oil; place the larger leaf piece in the dish to cover the bottom and the sides of the dish. The edges of the leaf should come up the sides and more to overlap. Pile the marinated fish steaks on the leaf, and scatter the green chillies around. Rest the leaf (cut to the exact measurement of the dish top) over the fish and overlap it with the edges of the bottom leaf. Set a heavy ceramic half-plate on the leaf parcel to stop them from opening up. Cover the baking dish with aluminium foil, and bake in a preheated (180 C) oven for 20 minutes. Whether it's the gooey mozzarella, the parmesan with meatballs in your pasta, or the plain old smoked gouda sometimes cheese can be the one silver lining at the end of a rough day or an otherwise mediocre meal. And for new chefs, cheese, like butter, can make everything better. After looking up recipes on the internet that need a whole lot of cheese, you are bound to start wondering where to get them in Dhaka. Here's the lowdown on the cheese market of Bangladesh -- who makes it and where to find it. Deshi cheese is available all across the city and they come in two varieties. One is the jhuri (basket) cheese made from cow milk that we see vendors selling and another is the same type of cheese made from buffalo milk. 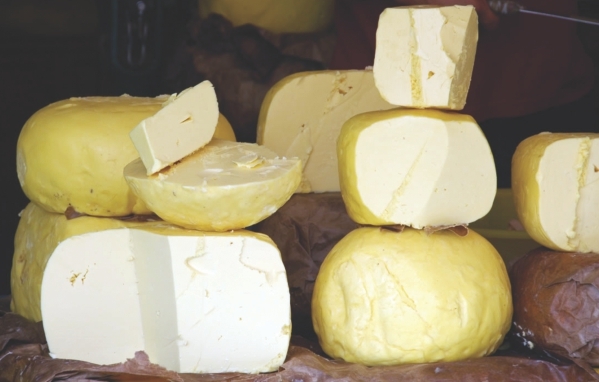 According to Shajahan Miah, a cheese-seller who sits near Sobhanbagh Mosque, the prices of both types of cheese are about Tk.550 to Tk.600 per kilogram. The cow milk cheese usually comes from the northern regions of Bangladesh, namely Naogan and Natore. The southern regions of Barisal and Noakhali, specialises in buffalo cheese. It takes about 12 litres of milk to get about 1 kilogram of cheese, which is processed through a semi-automatic system. If you love the salty goodness, you can find it all over the city in places like Baitul Mukarram, Chawkbazar, New Market and Sobhanbagh. However, if deshi cheese does not tickle your fancy, renowned companies like Pran and Quality produce a range of cheeses. They have the Dhakai cheese and mozzarella, while Gemcon Group sells packaged paneer and supermarkets like Meena Bazar have their own brand of cheese. They come in packets of 220 to 250 grams and cost about Tk.150. Even though basket cheese is the most widely available variety in Bangladesh, there are numerous other options to choose from. There is paneer -- the cheesiest Asian treat ever, which we all grew up with. This un-aged, non-melting cheese makes the world go round, if you know what to do with it. Then there is chhana, fresh un-ripened cousins of paneer and the pride and joy of Bangladeshi sweet makers. Not only is it beneficial for the lactose intolerant, it is also amazing even if you are just having it with sugar. If you would like to sample cheeses from abroad, a visit to a local supermarket will not disappoint. They come from all across the world -- from Australia, Denmark to the Middle East. The prices are higher than local counterparts but you have the option of tasting different flavours, perhaps some even a little out of your comfort zone. Brands like Lemnos, Castello, Bega, Laughing Cow, and Westland are available at the nearest Agora or Meena Bazar, along with old favourites like Kraft. They also carry several different types of cheese such as fetta cheese, blue cheese, cheddar cheese, emmental cheese, cream cheese, gouda, parmesan and mozzarella. The price varies accordingly but on average, individual cheese portions are about Tk.180, Westland Gouda is about Tk.500, Castello blue cheese is around Tk.410 and the costliest among them, Lemnos Fetta cheese is around Tk.1400. The price varies with the shops to some extent, and the more unusual varieties are available in some Gulshan stores. Grab the cookbooks and open up the old recipes that intimidated you. 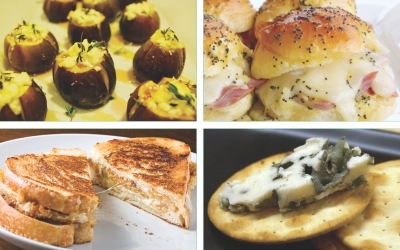 Treat yourself to a little bit of cheese, your future self will thank you.